1. Prepare Lemon-Caper Rémoulade: In small bowl, stir together all ingredients. Refrigerate until ready to serve. 2. 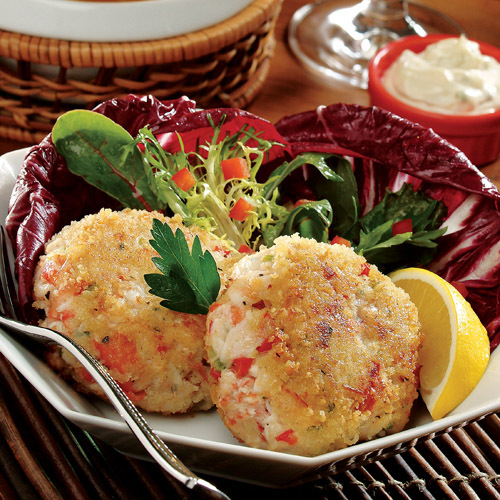 Prepare Crab Cakes: In food processor with knife blade attached, add bread and process to coarse crumbs; set aside. Add shrimp to food processor and process until smooth. Transfer shrimp to medium bowl; add crabmeat and stir until well blended. 3. In large skillet, heat 1 tablespoon oil over medium heat. Add garlic, celery, bell pepper and onion, and cook 2 minutes. Gently fold vegetable mixture into crab mixture. Stir in lemon juice, chives, Worcestershire, salt, pepper and cayenne. Gently fold half of breadcrumbs into crab mixture. 4. Line rimmed baking pan with plastic wrap. Form about 2 tablespoons crab mixture into bite-sized cakes; transfer to prepared baking pan. In batches, lightly coat crab cakes with remaining breadcrumbs. In large skillet, heat remaining 4 tablespoons oil over medium heat. Carefully add crab cakes to pan; cook 2-1/2 minutes per side or until golden brown. Transfer crab cakes to paper towels to drain. Serve with Lemon-Caper Rémoulade.